(ar -mă-lair-ee) A device, dating back to antiquity, composed of a set of graduated rings representing circles on the celestial sphere, such as the ecliptic, celestial equator, and colures. The whole globe often revolved about an axis – the polar axis – within horizon and meridian circles. Movable sighting adjustments enabled a star to be observed and its coordinates to be read off the relevant circles. An illustration of the type of armillary sphere used by the great scientist Tycho Brahe. Reproduced by permission of Fortean Picture Library. An armillary (from Latin word armilla, meaning “bracelet”) sphere is a skeletal sphere consisting of rings that represent the more important celestial circles utilized by astrologers—the ecliptic, the meridian, the horizon, the celestial equator, etc. His personal emblem, the armillary sphere, is present in all three tapestries, including being the centrepiece of one. 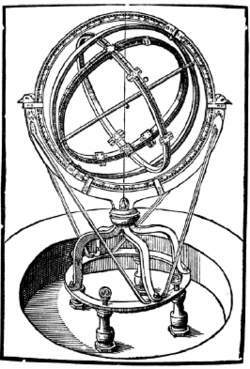 While the nature of the instrument is as yet unclear, it appears to have been an instrument having the same applications as the armillary sphere. According to Susan Watkins, the combined symbolism of the armillary sphere in Elizabethan portraiture signifies "prudence or wisdom" (84). The armillary sphere is an ancient astronomical device used to illustrate the old geocentric universe (the "world" in the parlance of the day), and is a most fascinating device, both in its historical roots and mechanically. The photograph here shows Hubble and Nicolas posing with an armillary sphere. Although the sky rolls forward unassisted by hydrodynamic propulsion, about 2,000 years ago, during China's Later, or Eastern, Han dynasty (AD 23-220), a renowned and innovative astronomer, Zhang Heng, coupled a water clock with an armillary sphere to drive that instrument at the diurnal rate. He installed the first, a couple of feet in diameter, inside the rings of an armillary sphere. I have included sundials and armillary spheres in garden designs for various clients but had never heard of a Human Sundial until talking to Mike Faraday. Well-established royal astronomers used big, wooden or bronze armillary spheres to track the Sun, planets, and stars more precisely, but the astrolabe let any well-off amateur do it with a brass disc hung on his belt. From water flow to sun dials to astronomer priests to armillary spheres and more, humans have wanted to track time from the earliest days. Wiseacre's Wizarding Equipment, where folks can buy telescopes, binoculars, armillary spheres, compasses, magnifying glasses and hourglasses. Armillary spheres were originally used to make astronomical measurements, but gained huge popularity in the 18th and 19th centuries as a means of teaching astronomy.